They're perfect on-screen and off. Asan ang hustisya?! In Philippine showbiz, it's pretty common for on-screen love teams to eventually admit that they're dating IRL. Some celebrity couples even get film and TV projects based on the fact that they're together. These high-profile celebs first met when they got cast for Giordano advertisements. Reports say that they developed feelings shortly after (with Kim Woo Bin making ligaw like a real gentleman!!!) and hid their relationship for a while. After photos of the two circulated at one point in 2015, each of their agencies confirmed the relationship and they have been dating ever since. There were even reports of a premium food truck being sent by Shin Min Ah to Kim Woo Bin’s filming location (such a sweetheart!) and the pair being spotted on a date by a fan recently. Now, the question on everyone's mind is: When are they going to pair up for a K-drama?! That would be SO epic. Lee Min Ho previously dated his co-star in City Hunter Park Min Young, but that didn't last long. A couple of years after, his relationship with Bae Suzy got publicized (with alleged secret dates in London) and confirmed. A Korean celebrity news site also cited a netizen saying they met through a mutual friend and Lee Min Ho pursued the Miss A member. At one point, the Legend of the Blue Sea actor even said he'd marry Suzy. Awww! 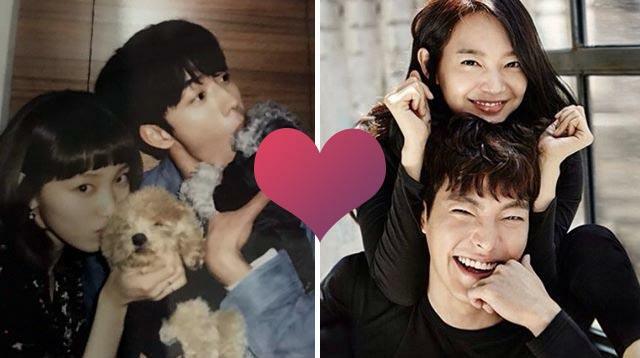 Like Kim Woo Bin and Shin Min Ah (whom the pair goes on double dates with, a report says), they also haven't starred in a K-Drama together yet. Maybe once Lee Min Ho gets discharged from military duties. This couple is a match made in K-pop group heaven. The two idols knew each other as trainees and got close over the years. Eventually, their romance blossomed and their relationship, which was announced on April 1 last year, was confirmed by their agency, SM Entertainment (it was NOT an April Fools' joke, after all!) We wonder how they keep their love alive despite their crazy-busy schedules with f(x) and EXO going on world tours left and right. (Trivia: EXO's Baekhyun (10th Prince Wang Eun from Scarlet Heart: Ryeo!) and Girls' Generation’s Taeyeon from the same agency were also revealed to be dating in 2014 but sadly broke up in 2015. Here's another reel-to-real couple, but this time, they starred in a music video first (not a K-drama) before they dated in IRL. Taeyang admits that Min Hyo Rin (an actress) is his first girlfriend, and other BIGBANG members attest to how devoted Taeyang is (with G-Dragon claiming to be their ~matchmaker~ LOL!). In one interview, they even shared how he always takes the blame whenever they fight like normal couples do. At another interview, Taeyang shares how thankful he is for the love he found in Min Hyo Rin, which "feels as if rain is softly touching my dry heart," according to him. SO. CUTE.